Here we are back for another weekly recap. This week is also Bloggiesta so I'll be spending a lot of time working on some updates to the blog. You can see my full list of to-do items for Bloggiesta here: My Spring Bloggiesta To-Do List. I didn't manage any other posts last week, but hope to catch up with reviews as one of my things to focus on this week. 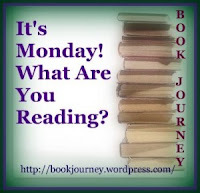 I finished reading September Sky by John Heldt, so I plan to write that review this week. Then I started reading The Precious One: A Novel by Marisa de los Santos. I'm keeping my recap quick this week so I can focus my time on the updates I want to make during Bloggiesta, and on reading. I'm also spending extra time with the family since my kids have a bit of a spring break this week. They'll be in school a couple days, but have the rest of the week off. I usually like Marisa de los Santos' novels - she is from Delaware so a local author for us. I'll have to check this one out. Enjoy your books this week and the time off! I haven't read anything by her before but I'm enjoying this one so far! OOhh I like the sound of the Precious One. I hope you are liking it so far. It's good so far. I just wish I had more time to read this week!